Disney is going all out this summer with nothing less but three new animated series on their XD channel. This includes a premiere of a Guardians of the Galaxy cartoon and a second season for both Marvel’s Hulk and the Agents of S.M.A.S.H. and Marvel’s Avengers Assemble. The news was announced at the Comic-Con in San Diego. 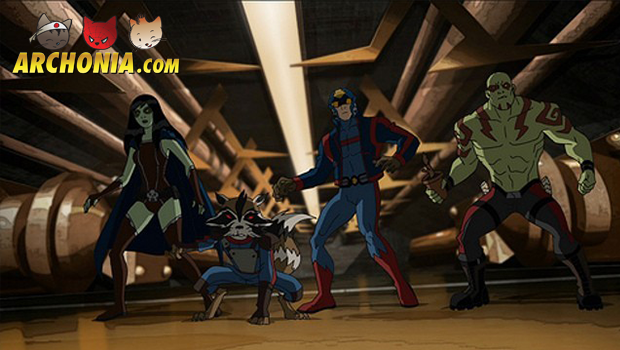 Marvel premiered early footage of the Guardians of the Galaxy animated series. Besides this, Creative Director Eric Radomski said that the Guardians will appear in episodes of all current Marvel animated series, including ‘Ultimate Spider-Man’, ‘Hulk and the agents of S.M.A.S.H.’ and ‘Avengers Assemble’. For the Hulk cartoon the production team dived into one of the ‘biggest, most epic’ Hulk stories ever, according to Stephen Wacker, Marvel’s Television Vice President of Current Animation. The story is based on the comic book storyline ‘Planet Hulk’, ‘which sets the course for a cosmic catastrophe that is the backbone for much of the season’. Yikes! In the new Avengers Assemble season, “the threat of the cosmic warlord Thanos hangs over the team, threatening to destroy them from outside and in,” Wacker explains. Fans will also experience the rise of Ultron – who is the next villain in the Avengers live-action movie.